For most people, achieving a healthy, beautiful smile is the reason for choosing to receive orthodontic care. If you’re self-conscious about your smile, rapid tooth movement has been created for our adult patients. Our office utilizes Invisalign®. This treatment has been in use for many years, and with patient compliance, delivers a beautiful smile rapidly. Gone are the days when a metal band with a bracket was placed around each tooth. Invisaligners are clear plastic aligners that you can easily remove before meals and replace them after. We recommend wearing these aligners 20 hours a day. 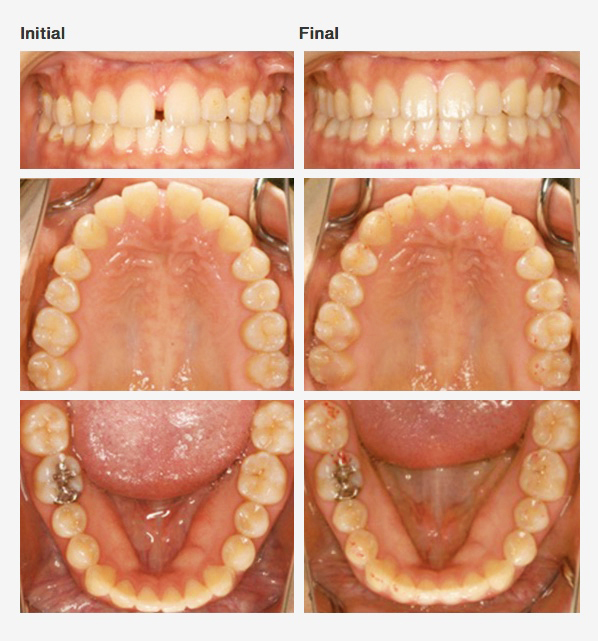 To view more before and after cases, click here. Before beginning your orthodontic care, we will discuss all your options and provide an estimate of how long your full treatment may take. Depending on several factors, including age, treatment method, and how minor or severe your case is, treatment time varies and can last between one and three years. A big factor to a successful treatment is you, the patient! The more involved and diligent you are, the quicker and more efficient your treatment will be. For children, receiving interceptive, or early treatment can also help ensure a quicker treatment time later on in life. To learn more about the rapid orthodontic treatment, and the treatments we provide and Invisalign, contact our office today at 617-965-7673 to schedule an appointment today.